Despite their apparent simplicity and clarity, Alexander Gronsky’s photos have an exceptional quality. They imperceptibly immerse an attentive viewer in a transfixed state. Entering the space of Gronsky’s landscapes from their pictorial plane produces a truly mesmerizing effect. The most eloquent proof of this is the recognition granted by art critics and photo industry professionals to his series “Less than One”, “The Edge”, “Pastoral”, “Mountains and Waters”. 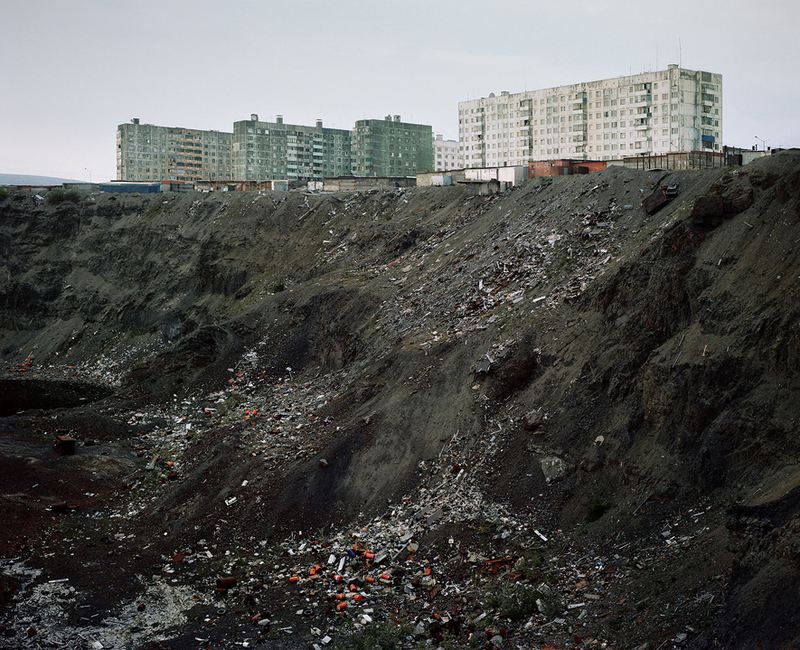 In naming some of the reasons for the artist’s demand both in the Russian-speaking world and in the international art space, critics primarily point to the stylistic attachment of his works to so-called neutral or “featureless” aesthetics that make them admired in both the photography and contemporary art domains, thereby doubling their value. At the same time, both the German and American documentary traditions are commonly considered artistic phenomena preceding and related to Gronsky’s work. 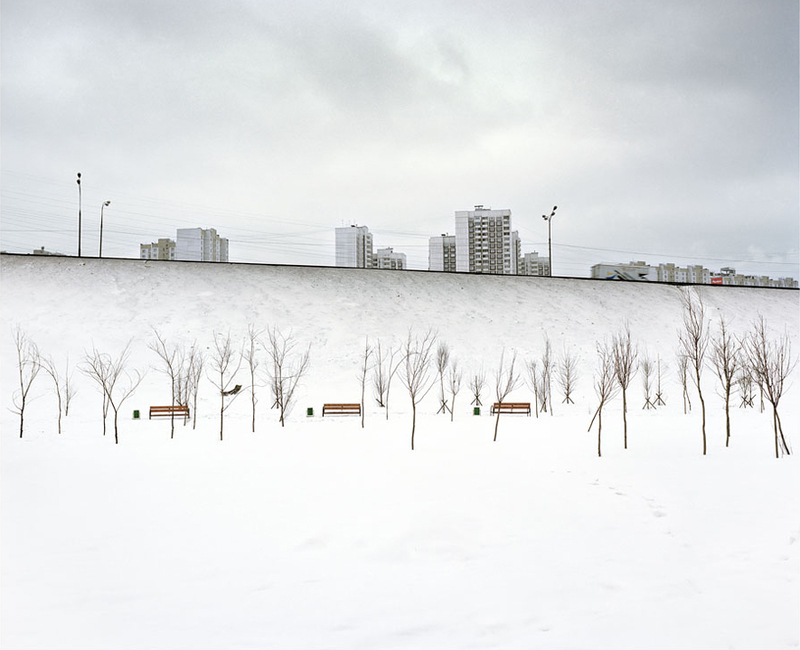 In the German tradition contemporary landscape photography originates from the works of conceptual artists such as Bernd and Hilla Becher, and flourishes in the works of their student Andreas Gursky. Gronsky’s method of creating and organizing images is formally akin to the German school – as in the use of medium and large format cameras, high vantage point, in the level of detail, and in the sheer scale of the exhibited works. However, the differences are obvious – Gronsky’s photos, as he insists in his numerous interviews, are deprived of a socio-critical view. 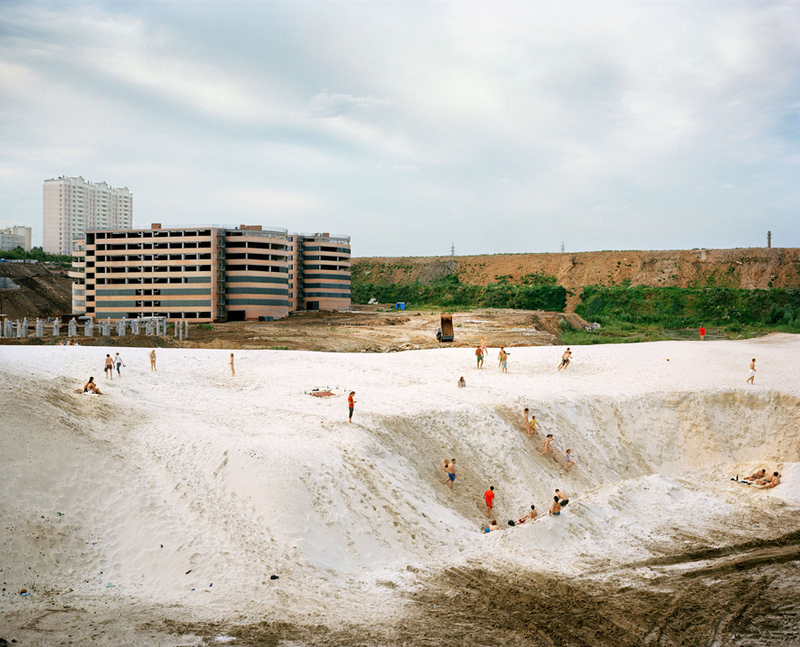 And he is equally alien to the environmental romantic pathos of the Bechers and to Gursky’s dramatic anti-consumerism. On the other hand, yet another source of Gronsky’s creativity is the American school with its important names such as William Eggleston, Stephen Shore, Joel Sternfeld – those who made color the basis of their whole photographic practice. Here it is important to mention not only the formal and technical coincidences, but also the object of representation itself – all above-these icons of the American (and indeed world) photography who peered into the ordinary. Following them, Gronsky also calls everyday life one of the cornerstones of his creative pursuit. 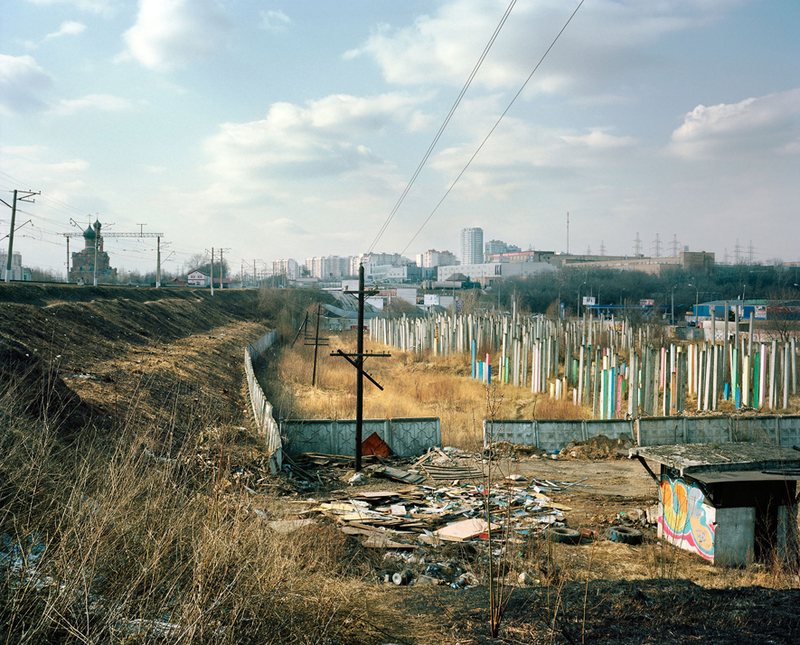 Yet, is it so everyday, the reality of his large-scale works, where the urban landscape is in the foreground, without any association with everyday object and direct human corporeality, in which everyday life is supposed to be rooted, as it is in the works of Eggleston, Shore and Sternfeld? Moreover, if the artist’s research were confined to the field of routine, where would this sense of numbness come from? The hypnotic appeal of Gronsky’s aesthetically cold works is based on the specific sense of time that they produce. This special temporality flows partly from the formal qualities of each particular image, which also reflect the essential features of photography as such. The key property here is the lack of depth and perspective in most of the images. Thanks to the utmost detail of all the components, the images flatten and become equal to each other in value and content. There is nothing to catch the eye – rather it saunters slowly and freely across the silent surface of the image back and forth and from side to side. Meanwhile, the boundaries are nominal: despite their masterly compositional and coloristic balance, the shots usually have no points of attraction, no center and periphery. The picture frame does not give logical finality to the narrative contained in the image. The frame here is only an unavoidable feature of the print’s material nature, and does not limit its metaphysical dimension lasting far beyond the image span. Due to this set of features something like a time-hole appears. This is not “a stopped moment” that is supposed to contain both preceding and succeeding moments, but timelessness with no logical beginning or end. Thus the space-time continuum, carefully constructed in Gronsky’s works, does not meet the features of everyday life as it is understood in the philosophical tradition. His time is unordered, space is nonfunctional, and the action or inaction of faceless human beings in all their impracticality sometimes fits well into the absurd plot. In its turn, the discovery of oneself in weightlessness of time while in a state of contemplation refers the viewer to the most similar and accessible experience of timelessness – to dreams and therefore to the phenomenon of the unconscious. In this light the category of boundaries – the interest of Gronsky the researcher, which defines the context of his most successful series – takes on a special meaning: a dream in some way is a boundary between the conscious and the unconscious; it is there that the unconscious announces itself. Thus artifacts which fill the images are dispersed at the boundaries between the natural and cultural, urban and rural, populated and unpopulated, can be captured as marginalized by a sort of mass consciousness and cause in the viewer a certain effect or tension, similar to the renowned Barthes’ punctum (disintegrated trash alone can expose a lot of curious things). Lacan wrote that the subject does not precede the world of forms that fascinates him; he is rather constituted by them and in them. Monotonous, vapid city outskirts with stereotyped buildings of dormitory areas constitute their invisible subject, whose face Gronsky deliberately does not show. His viewers of the unconscious merge with boundless landscapes, recalling plastic puppets on a field or board game – on “a scene”, as Freud would call it, where a dream unfolds. From this angle outwards, the boundless spaces of Gronsky’s images – an area of dream reality, Dreamland – transform into theatrical boards to reproduce some repressed traumatic event. This psychoanalytic statement resonates loudly with Gronsky’s most recent project – “Reconstruction”. In “Reconstruction” Gronsky documents the battles, recreated by historical reenactors, putting them in panoramic triptychs. In each of the three parts of a total image, a separate story unfolds, characters of which coexist in a mutual narrative under the law, denying common sense. The maskers and gapers, attributes of past eras and a modern architectural ensemble, are co-presented in one statement and form a dreamy concentration of meanings. The idea of dehumanization of a hero, dissolved in landscapes of event-free plays (“Less than One”, “The Edge” and “Pastoral”) finishes in an unexpected way. Faceless masses come to the wasteland of city outskirts, finally acquiring a face, but not a true one, rather a mask. According to the author, “Reconstruction” was supposed to refer to the idea of museum military dioramas. At the same time, it begins a dialogue with the photographic series of the same name by Japanese master Hiroshi Sugimoto, as honored by Gronsky. His project “Dioramas” is based on a dual perception of stuffed animals, exhibited against scenic backgrounds: on film and versus reality they look alive. In Gronsky’s series a counter-effect emerges – living people seem to become dummies. In this regard, he remains true to himself, though, on the other hand, draws closer to Andreas Gursky with his critical mood. Where Gursky’s object of consumption lies on supermarket shelves, Gronsky’s one is an act of war, inhumane in its essence. If in some earlier series critics fancied they saw Pieter Bruegel, after “Reconstruction” one might equally recall his predecessor – Hieronymus Bosch, who not only painted triptychs, but also engaged in sharp satire. This analogy seems more than appropriate, bearing in mind the reputation of the artist as a forerunner of surrealism and our discussion of the oneiric reality of Alexander Gronsky’s works and his specific country of dreams – Dreamland. © Bleek Magazine. Text: Feodora Kaplan. Translation: Darya Kuznetsova, Richard Cashman. The images are provided by Grinberg Gallery, Moscow, Russia.